In a blaze of emailing glory we notified our known universe about the free and oh so useful "Homeowner Education Pack". 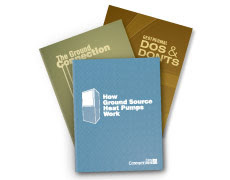 Available through the GeoBookstore, this collection of downloadable PDFs covers, how geothermal heat pumps work, explains the differences in common loopfield configurations and has a quick reference of dos and don'ts for homeowners looking into geo and for those that own a system already. The Homeowner Education Pack is a fantastic resource for installers and designers presenting their geothermal system bids to new customers. They are totally free and they have a ton of good information that can make your first meeting go much more smoothly. You can send your customers to our site to download it, print it for them or email it to them but no matter what, you should get these guides into the hands of your customers. The only thing we ask is that you don't post them directly to your own site. We have tried to give them a good home and we would appreciate it if you simply added a link to their home if you want to share through your website. Geothermal And Thermostats: Set It and Forget It! © Copyright 2013-2017 Geo-Connections, Inc.. Powered by Blogger.